In the summer of 1998, JoJo David sat in a hospital emergency room and stared at the X-ray of the tumor crushing his vocal cords. The nerves were irreparable, doctors told him, and his raspy whisper, a trademark of the virulent cancer in his chest, would be his new, permanent voice—if he survived. For the next 14 months, David, a composer, pop singer, liturgical musician, original member of the a capella group Five O'Clock Shadow, andthe vocal director of BC bOp!, Boston College's jazz ensemble, chronicled his struggle with non-Hodgkin's lymphoma in a series of emails to his friends and family. Boston College Magazine published excerpts in the spring of 2000, after he had endured nine hits of chemotherapy, 28 radiation treatments, and a high-risk bone-marrow transplant that ultimately purged David of the cancer within, but left him feeling barren and blank, "as if my spirit was eradicated with my bone marrow, yet never replaced." This past spring marked the five-year anniversary of David's initial diagnosis, and brought a clean bill of health from his oncologist. The last half-decade bears hallmarks of a life-restored: a new house, a new position at Boston College as the associate minister for liturgical arts, and a renewed dedication to music. It has also, says David, brought miracles: Defying medical explanation, his tenor voice has returned to its original timbre, coming around tone-by-tone, day-by-day. And on October 7, he and his wife, Anne Marie, the liturgy music coordinator for the University's Institute for Religious Education and Pastoral Ministry, welcomed their first child, a daughter. 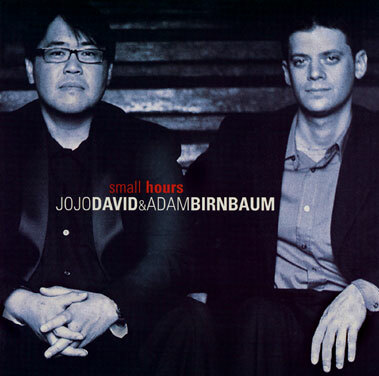 This September, David released his first album as a solo vocalist, Small Hours, a collection of modern ballads and jazz classics, performed with Adam Birnbaum '01 on piano. While a student at BC, Birnbaum worked often with David, and was a member of BC bOp! in 1999, the year the ensemble dedicated its performances at the prestigious University of Nevada at Reno's Jazz Festival to the ailing David (and took away an unprecedented fifth place and festival-high four individual awards). As both arrangers and performers, David and Birnbaum strike an intimate, quiet mood in their music. From standards like "In the Wee Small Hours," by David Mann and Bob Hilliard, to fresh interpretations of the Beatles' "Golden Slumbers," and John Hiatt's "Have a Little Faith," each song is about "moments when you are small enough to be yourself," says David. Ron Della Chiesa, the host of Classics in the Morning and The Jazz Songbook on WGBH Radio in Boston, says "Birnbaum's playing is exquisite, and David's lyric voice caresses the music. You feel when you listen to him that he's lived the stories in these lyrics." Had he not lived through his own small hours, David says, he might not have dedicated himself so readily to this album. "Nearly losing my future made me focus," he says. "When it comes down to it, I don't want to find myself wondering about all the options I encountered in my lifetime. I want to look back and know what I did." Cara Feinberg is a Boston-based writer.